Catering Manager cover letter example. Amend as suitable and start writing your covering letter in seconds. You can use cover letters along with your CV or you can also attach it to your job application. 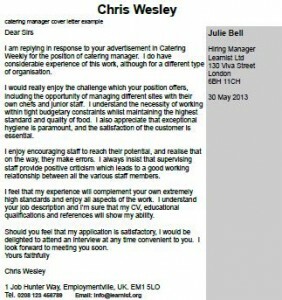 I am replying in response to your advertisement in Catering Weekly for the position of catering manager. I do have considerable experience of this work, although for a different type of organisation. I would really enjoy the challenge which your position offers, including the opportunity of managing different sites with their own chefs and junior staff. I understand the necessity of working within tight budgetary constraints whilst maintaining the highest standard and quality of food. I also appreciate that exceptional hygiene is paramount, and the satisfaction of the customer is essential. I enjoy encouraging staff to reach their potential, and realise that on the way, they make errors. I always insist that supervising staff provide positive criticism which leads to a good working relationship between all the various staff members. I feel that my experience will complement your own extremely high standards and enjoy all aspects of the work. I understand your job description and I’m sure that my CV, educational qualifications and references will show my ability. Should you feel that my application is satisfactory, I would be delighted to attend an interview at any time convenient to you. I look forward to meeting you soon.